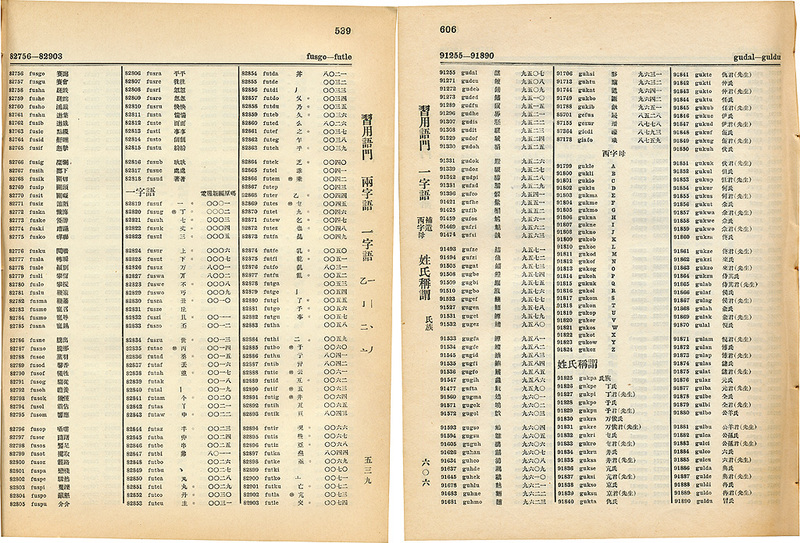 The China Republican Telegraphic Code is conceived along the lines of a standard telegraphic code of its time — with phrases arranged under topical headings, those headings themselves arranged arbitrarily. This code does not, that is to say, follow the convention of one (Chinese) character per number. (16 unnumbered front matter pages), 1-736, followed by colophon. I will present all prefatory material in black and white scans, minus margins and gutters, for reference. 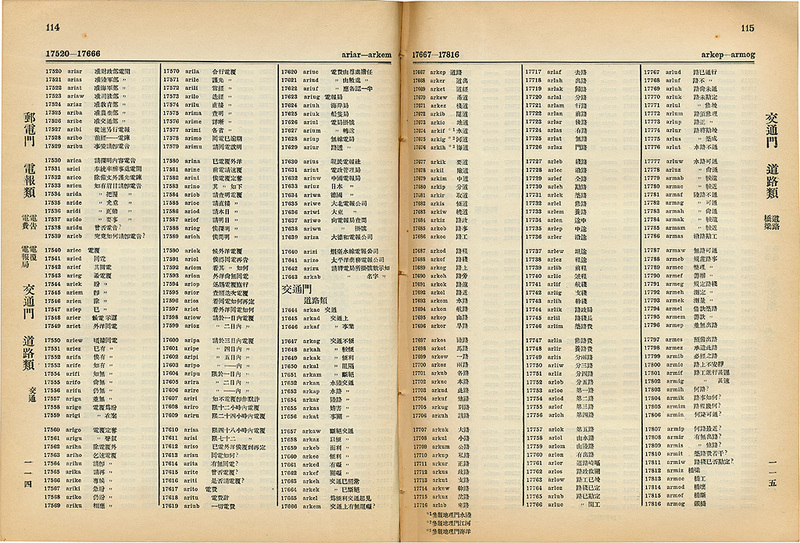 Incorporated within the code is the standard Chinese charactertelegraph code, wherein each character is assigned its telegraphic number. 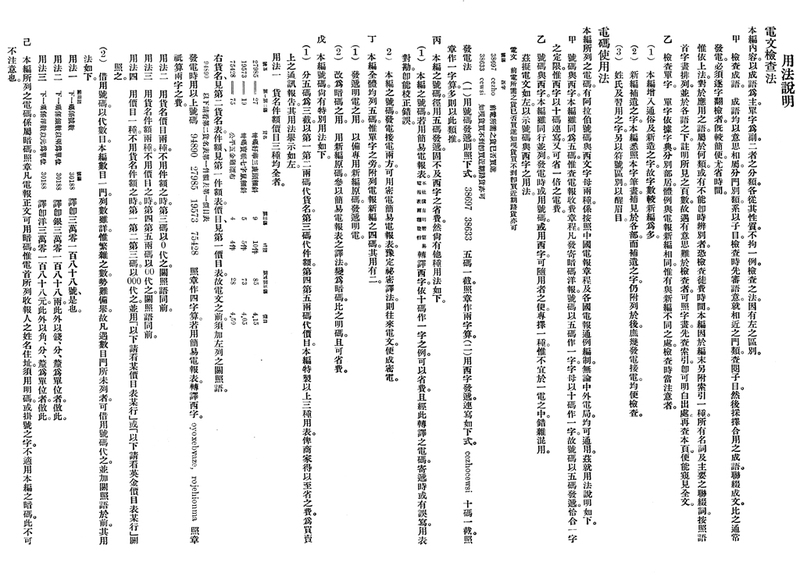 Shown below are the first and last pages of that section (pp 539-606), beginning with 82817 / fusuf for character No. 1 (meaning one ) and concluding with 87178 / giafo for character No. 8759 (meaning to spread ); I do not (yet) understand the several entries that are not in serial order (on this and preceding pages). There follows a sequence of 5L codewords for the 26 letters of the standard roman alphabet.